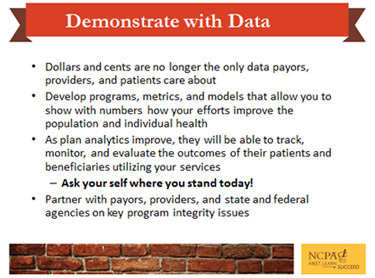 This is part of NCPA’s active leadership role on behalf of our members to put them in the best possible position as these trends continue and accelerate. Let me try to condense the morning down into this post and save the afternoon for a follow-up communique. David Pope, the Chief of Innovation at Creative Pharmacist, joined me in co-hosting the day. David set the tone reminding everyone of Wayne Gretsky’s key to success: skate to where the puck is going. The all-star lineup of speakers then proceeded to help all of us look forward to see where the health care puck is headed and what pharmacy can do today to get our stick on it. I think the group could have engaged Charlene and Jeremy in dialogue all day long, but we wanted to add a perspective from the private business sector and for that we turned to Dr. Gloria Sachdev of Purdue University. In case there remained any doubt, Gloria told us again that quality is the wave of the future and we must learn to surf or sit on the beach. Fortunately, we had a room full of folks who were ready to Hang Ten! 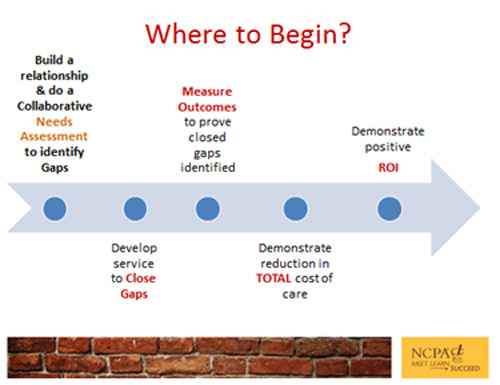 With all the risk-based programs out there, a key first step is to identify the gaps in care; where do we need to improve? 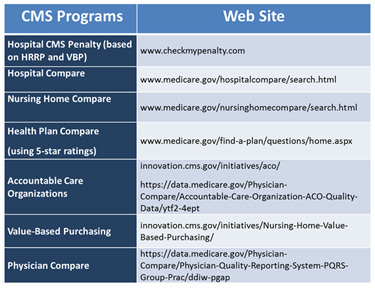 Gloria provided this list of great websites that give excellent needs assessments. How is that health care facility near your pharmacy doing and what things are having a negative impact on their revenue (which creates opportunities for you to collaborate)? Self-insured employers are the ultimate payer making decisions on which health plan, PBM, benefit design (e.g., carve outs for MTM) to use. Pharmacies need to demonstrate how our services are going to lower health care costs and what we can do better than what is already available in the market. Start with the HR person who will have concerns about positive ROI and delivery of consistent service across entire employee population. Wrapping up the morning, three payers who are actively engaging pharmacies in pay-for-performance opportunities took the stage and one of our high performers, Joe Moose, moderated a lively discussion. You can meet Joe here. Doug Stephens (CVS/caremark), Bhavesh Modi (Healthfirst), and Chris Chan (Inland Empire Health Plan) all expressed their belief in what community pharmacy can do and are putting money on the table to pay for performance. All three are using the quality measures available through the EQuIPP platform to evaluate pharmacy performance. Their plea was for pharmacies to ENGAGE and take advantage of the opportunities. Doug Stephens had the same message for pharmacies when it comes to MTM cases on Mirixa for SilverScript beneficiaries: do ’em or lose ’em. What a great morning it was, networking with payers and collaborating to #rethinkpharmacy. Time to refuel and then come back to talk about what high performance pharmacies are doing today to position themselves to help close the care gaps and partner with their patients to meet the needs of these payer customers.